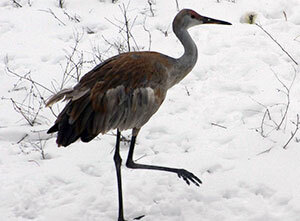 The Milwaukee County Zoo is happy to welcome Holly, a female sandhill crane, to its animal collection. Hatched last spring, Holly arrived at the Zoo after Thanksgiving and has been on exhibit in the Moose Yard since Christmas. Holly sustained a wing injury in the wild and was sent to a rehabilitation facility. She came to the Zoo when it was determined the injury would prevent her from being re-released into the wild. 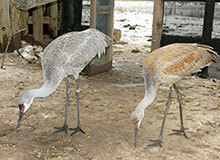 Holly will serve as a companion for our older sandhill crane, a female named Sparky. Zookeepers are closely monitoring the interaction between the two cranes and between the cranes and the moose. Each animal has an individual personality that can affect their social interactions. So far, the cranes have generally given the moose plenty of space, but they are comfortable being near each other when necessary. Holly is still young, so she follows Sparky’s lead throughout the exhibit. She will now come into her feeding area on cue and has cooperated with her zookeepers by stepping onto her scale when needed. Since she is so young, Holly is still getting her adult coloration and plumage. Her feathers are changing from brown to grey and her forehead is changing to a dark red color.